Increasingly expensive cars have given rise to a huge increase in automotive leasing in recent years. Could the same thing be happening to smartphones? 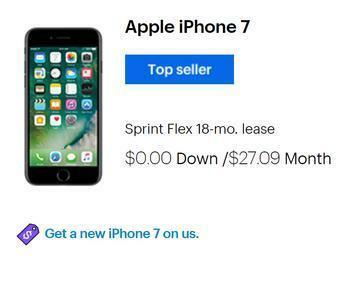 Sprint has announced that it will allow customers to lease any smartphone and upgrade it after one year. Previously, leasing was limited to the iPhone and Samsung Galaxy models. Robert Hackl, Sprint's senior vice president of leasing, made the announcement in an interview with Reuters. "We want to give full flexibility to our customers because you don’t want to get stuck with an old phone," Hackl told the news service. In recent months the big four cellular carriers have stepped up the competition on service plans, providing more data and lowering costs. At the same time, the cost of smartphones has continued to rise. The price of Samsung's Galaxy S8 Plus is $840. Apple has made no announcement about its next generation iPhone, expected later this year, but CNET estimates it will sell for $850 to nearly $1,100. But just as some consumers lease expensive cars they really can't afford, consumer advocates are cautioning that the same thing can happen when leasing a smartphone, albeit on a smaller scale. The Los Angeles Times reported last year that many prepaid wireless companies offer leasing plans, but at very high interest rates. Fierce Wireless reports the Sprint lease deal appears to be less costly. It says the terms for low-priced devices is $25 down and $5 a month and $30 down and $10 a month for more costly phones. Customers can upgrade after a year at no charge.